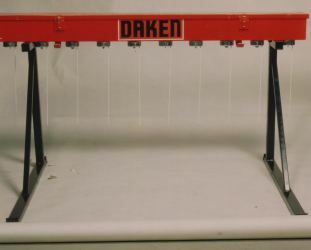 The Dakenag C Seeder can handle a variety of seeds and is a cheap effective way of over-sowing pastures. It easily mounts to many implements. It is available in sizes 4’ to 7’. · Depth Wheel, common to all models. Wheel can be mounted inside. No Maintenance - No Working Parts - No Cleaning - No Oiling! The standard box is 7' with 14 Sowing Cups each 6" apart. 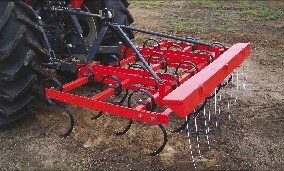 Sowing capacity 30-35lbs. Sows all types of seed in any type of terrain. Individual settings for each run. Sows lucerne, clover, phalaris, rye grass, and rhodes grass, mixed pasture seeds and grain sorghums. These rates are intended to give the operator a guide to the setting on which to start off. It is recommended that the sowing be checked by either of the methods set out above, when a job is started. These sowing rates are for tractor speeds of 3 to 4 km per hour, and unless the speed is altered considerably, it is unnecessary to alter the sowing rate; a faster speed gives more wire movement, hence more seed. Part No. Model No. of Tynes Working Width Part No. Model Model/Part No.